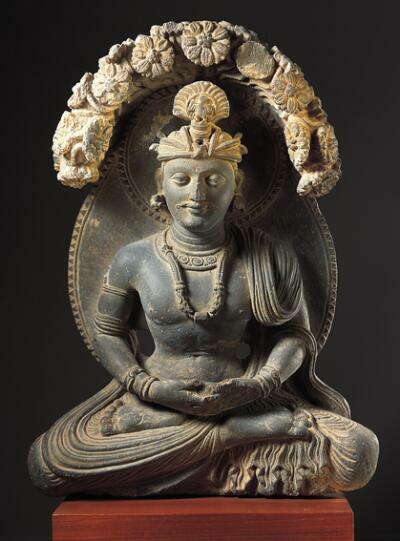 As a young prince, Siddhartha (the given name of Buddha) was taken into the fields to witness a plowing contest. He observed men sweating and exerting themselves as well as birds swooping down from the sky devouring insects. He soon became overwhelmed by these events, as they reflected the misery of human life and the inevitability of death. He left the contest and wandered until he found a wood apple (jambu) tree. He sat beneath this tree and entered into a trance. This event was a precursor to his subsequent meditation under the bodhi tree. A man meditates under a tree, but this is not a scene of the Buddha’s enlightenment. His mustache, jewelry and clothing, including his turban, indicate that he is a prince: Siddhartha, the future Buddha, who has not yet left home to seek enlightenment. Here, the story has been condensed into a single powerful image, intended for worship in a shrine or temple. Notice how the young man, his eyes half shut in concentration, expands his chest and draws in his abdomen to practice intense yogic breathing. The halo behind his head clearly indicates the sacred nature of this very human moment. The sculptor has shown impressive skill in the details here—from the prince’s lion earrings, symbolizing his princely status, to the graceful folds of the shawl draped over his arm.